I know I'm late in reading Stephen Donaldson. I decided to try it after seeing his name each time I picked up my Malazan books. He won some awards and seems to be well loved. 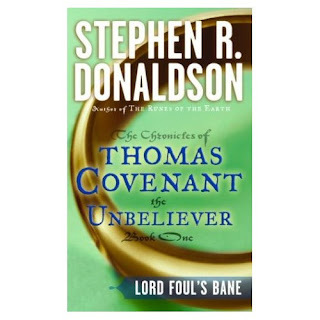 So I read the first book of The chronicles of Thomas Covenant the Unbeliever, Lord foul's bane. First, I have to say that I hate it when the story starts in the real world. One of the reasons I think I read fantasy is to get lost in another universe and I don't need that real world link. I continued reading anyway since I knew that many fantasy lovers were big fans of his work. Biggest problem for me? Thomas Covenant himself... and since the story is given through his eyes... The guy is infected with leprosy... that's not really the main problem, just a little annoying for my taste. He gets to that other world and then he rapes the first girl he meets... How can I wish to learn more about that guy? At least after that, he can only get better! As I continue reading, the good old plot unravels. The simple guy who doesn't know that prophecy and destiny have chosen him gets on a quest to kill the super evil villain and he walks the country. Then, a little bit later in the story, (small spoiler here I think).... we discover that the "spikes" that attack him are doing so because of his boots from the real world. He then decides to keep them on! That was too much, I put it down... The book is not that bad in itself, it's just really not my kind of thing. I know that the story and Thomas are evolving with the other chronicles so maybe someday I will give it another chance. Until then, I think there's too much stuff that will fit my taste to finish this book. do yourself a huge favor and finish this book.i totally get where you are coming from,i had the same issues.but labor on,its worth it.